Test your webpage for iOS 9 Search APIs. Enter a URL and Applebot will crawl your webpage and show how you can optimize for best results. Learn more about Search for Developers. Make it easy for users to discover information in your apps and websites by surfacing your content in Search on iOS 9. And with seamless universal linking, you can take users to the best place to view search results. Deep links make it easy for users to get back to where they were in your app — just indicate that your app is eligible for Search and iOS 9 will create links for you. 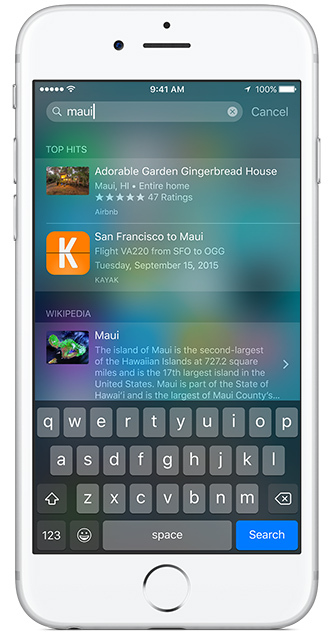 Help users find relevant information within your app by using Core Spotlight to add content to the iOS 9 Search index. Indicate the content on your website that can be accessed from your app and make that content available in Search. iOS 9 supports flexible universal links that seamlessly take users to your website or directly into your app if they already have it installed. Seamlessly link to content inside your app, or on your website in iOS 9. With universal links, you can always give users the most integrated mobile experience, even when your app isn’t installed on their device.